Elise L. Ashpole, D.M.D., graduated with her Doctorate of Dental Medicine in 2000 from the University of Louisville, Kentucky. 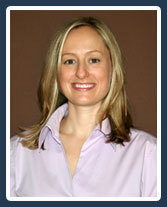 She has since been practicing family dentistry in the Decatur and Atlanta communities. Since conferment of her degree, she has continued advancing her knowledge through Continued Education courses. These include specialized courses in implant restoration, esthetic dentistry and oral surgery. You can be assured of her breadth and proficiency of care.